Burglary – On March 03, 2016 at 8:32pm, Patrolman David Bowden responded to a residence on the 100 block of Barnegat Blvd., for a reported burglary. The victim advised that sometime between 3:30pm and 8:30pm someone broke into the residence through a rear window. The victim listed a safe containing jewelry and cash stolen from the residence. Detectives responded to the scene for processing and evidence collection. Anyone with information is asked to contact Detective Sergeant Altman at 732-286-6000 ext. 191. 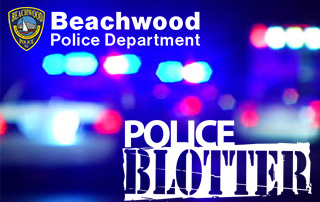 Criminal Mischief – On March 05, 2015 at 12:12pm, Patrolman Phil Schena responded to the Beachwood Post Office for a disorderly customer. Upon the officers arrival he was advised by Post Office personnel that the customer had left the scene but that the customer had become upset after being advised of an additional postage cost to mail a package and then punched the wall causing damage. Theft – On March 07, 2016 at 1:22pm, Patrolman David Bowden responded to a residence on the 300 block of Capstan Ave. for a theft report. The victim reported that a male juvenile walked onto the property and took a bicycle. Once confronted by the resident the juvenile drop the bicycle and left the scene. Officers located the male juvenile and signed a juvenile complaint for theft. DWI – On March 08, 2016 at 3:29pm, Sgt. Frank Melillo, responded to a minor motor vehicle accident on the 200 block of Beachwood Blvd. As a result of the officers investigation, the driver, Donald Armstrong Jr., 52 of Beachwood was arrested and charged with driving while intoxicated. He was transported to Beachwood Police Headquarters where he was processed and released to a family member as per John’s Law. The case is pending in court. Theft – On March 10, 2016 at 6:19pm, Patrolman Keith Meissner took a report from a male who reported that while his vehicle was parked at 229 Neptune Avenue, an Iphone 6 was stolen from his vehicle. Fire Call – On March 11, 2016 at 5:33pm, Patrolman David Bowden and Sgt. Mussari responded to a report of a brush fire in the area of Pinewald Road and Anchor Avenue. Beachwood Fire Company responded and extinguished the small fire. Theft – On March 15, 2016 at 10:55am, Patrolman Phil Schena responded to a residence on the 400 block of Anchor Avenue for a report of a stolen vehicle. The victim advised that sometime between 9:30pm on March 14 and 8:30 am on March 15 someone stole his 2001 Mazda 626. The vehicle was described as a 4dr silver in color Mazda and was left parked in the roadway unlocked with the keys in the ignition. Detective Sergeant Altman was assigned the follow up case.